This continues our weekly roundups of the Fall and Winter Leagues, highlighting performances from players in the Red Sox organization. Coverage will continue every Monday into January. For the full list of Red Sox prospects participating in these leagues, check out our Fall & Winter Leagues page, which will be updated continuously through January. This week's roundup covers the period of November 26 - December 2. Domingo Tapia was due for some regression after entering the week with a 0.00 ERA over 12 innings, and it happened on Monday night. Tapia did not record an out and allowed three runs on three hits. He was able to bounce back with a scoreless inning with two strikeouts on Friday. Jhon Nunez appeared in three games, going 1 for 7 with a double and two strikeouts. It was another strong week for Enmanuel De Jesus (pictured, above) as he struck out four and allowed two hits over 2 2/3 scoreless innings. Juan Hernandez went 3 for 14 over five games with three RBI and three strikeouts, and Deiner Lopez went 1 for 5 with a walk. Newcomer Juan Centeno got playing time in four games last week, going 1 for 9 with two walks and two runs scored. His teammate Jeremy Rivera saw action in six games, going 4 for 19 with two walks and an RBI. Both Harrison Cooney and Jake Romanski continue to see regular playing time for the Melbourne Aces, with Cooney tossing two scoreless innings last week and Romanski going 4 for 15 with a solo home run. The Boston squad went 4-2 in a busy week, with Christopher Acosta's dominant start on Thursday being the key highlight. 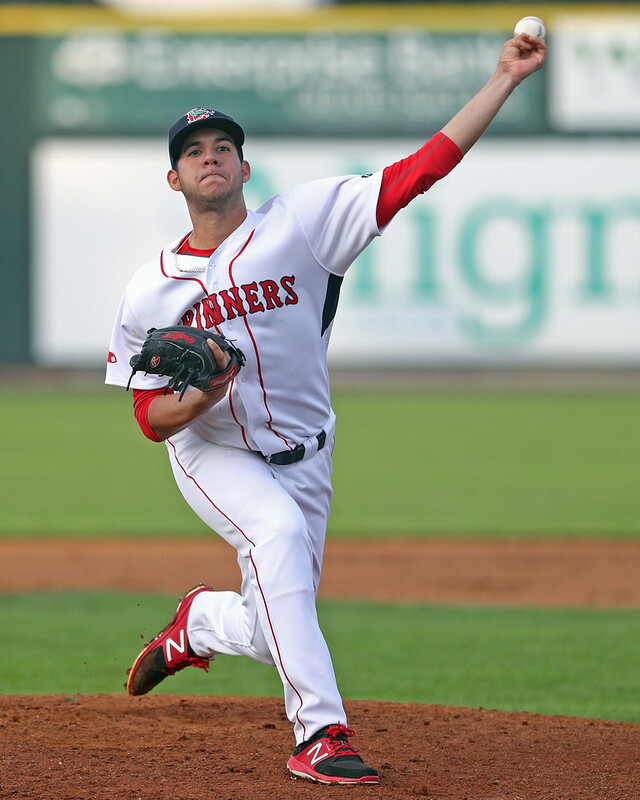 Acosta allowed only two hits and did not walk a batter over six scoreless innings, striking out five. Acosta now has a 1.73 ERA with 24 strikeouts in 26 innings. Another pitcher that has been impressing is Beiker Pineda. In two outings this week he threw five scoreless innings, allowing only one hit while striking out nine. The offense has been led by the trio of Victor Acosta, Pedro Castellanos, and Carlos Tovar, and last week was no different. Castellanos is currently leading the league with a .480 average, a 1.423 OPS, and 28 RBI, and he is second with six home runs. Tovar is second in the league with a .354 average, while Acosta is hitting .315 with a .968 OPS and three steals in as many attempts.